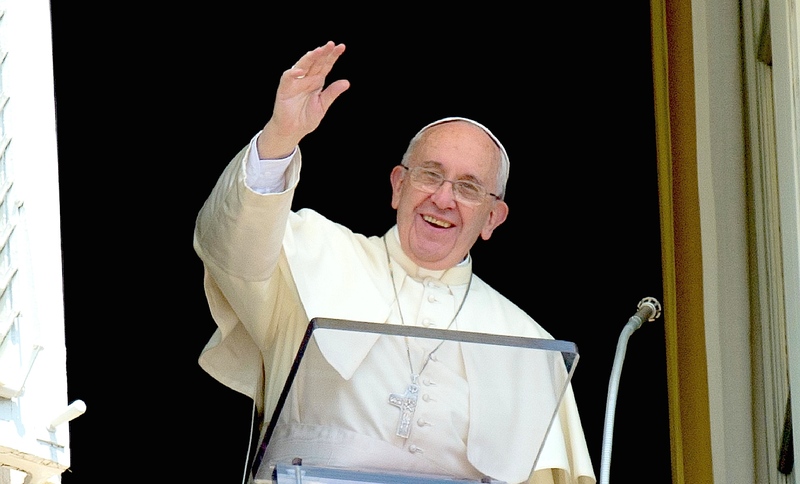 Here is a ZENIT translation of the address Pope Francis gave today before and after praying the midday Regina Coeli with those gathered in St. Peter’s Square. Today, in Italy and in other countries, the Ascension of Jesus into heaven, 40 days after Easter, is celebrated. With how today’s Gospel of Matthew (cf. Mt 28: 16-20) concludes, we are presented with the moment of the definitive departure of the Risen Lord from His disciples. The scene is set in Galilee, the place where Jesus had called them to follow Him and form the first nucleus of His new community. Now those disciples have gone through the “fire” of Passion and Resurrection; At the sight of the Risen Lord, they bow to Him, some are still doubtful. To this frightened community, Jesus leaves the immense task of evangelizing the world; And concretizes this assignment, ordering them to teach and baptize in the name of the Father and of the Son and of the Holy Ghost [Holy Spirit] (cf. v. 19). The Ascension of Jesus into heaven, thus, constitutes the end of the mission the Son has received from the Father and the beginning of the continuation of this mission of the Church. From this moment, in fact, the presence of Christ in the world is mediated by His disciples, by those who believe in Him and announce Him. This mission will last until the end of history and will enjoy the assistance of the Risen Lord daily, Who assures: “I am with you every day, until the end of the world” (v. 20). His presence brings strength in persecutions, comfort in tribulations, support in the difficult situations which meet the mission and proclamation of the Gospel. The Ascension reminds us of this assistance of Jesus and of His Spirit that gives confidence and security to our Christian witness in the world. He reveals to us why the Church exists: She exists to proclaim the Gospel, only for that! And also, the joy of the Church is to announce the Gospel. We are all baptized by the Church. Today, we are invited to understand better that God has given us great dignity and responsibility to announce it to the world, to make it accessible to humanity. That is our dignity, this is the greatest honor of each of us, of all baptized! On this Day of the Ascension, as we turn our gaze to heaven, where Christ ascended and sits at the right hand of the Father, we strengthen our footsteps on earth to continue with enthusiasm and courage on our journey, our mission of witnessing and living the Gospel in every environment. However, we are well aware that this does not depend primarily on our strengths, organizational skills and human resources. Only with the light and strength of the Holy Spirit, can we effectively fulfill our mission of making Jesus’ love and tenderness more and more to the knowledge and experience of others. We ask the Virgin Mary to help us contemplate the goods of heaven, which the Lord promises us, and become more and more credible witnesses of His Resurrection, of True Life. I want to express my closeness to my dear brother [Coptic Orthodox] Pope Tawadros II and the Orthodox Coptic community in Egypt, which two days ago suffered another act of fierce violence. Victims, faithful, including children, were going to a sanctuary to pray, and were killed when they refused to deny their Christian faith. The Lord welcomes these brave witnesses in His peace, and may He convert the hearts of the violent. We also pray for the victims of the terrible attack on Manchester last Monday, where so many young lives have been cruelly taken. We are close to the families and those who weep for those lost. Today, one celebrates World Social Communications Day, on the theme “Do not be afraid because I am with you” (Is 43.5). Social media offer the opportunity to share and disseminate news instantly; Such news can be beautiful or bad, true or false; Pray for communication, in all its forms, to be truly constructive, in the service of truth by refusing prejudices and by spreading hope and trust in our time. I greet you all, dear Romans and pilgrims: families, parish groups, associations, schools. In particular, I greet the faithful from Colorado; The Bavarian folk groups who came for the great parade in the centenary of the patron saint of Bavaria; And the Polish faithful, with a blessing also for those attending the pilgrimage to the Piekary Shrine. I greet the Comboni Missionaries, who celebrate 150 years since their foundation; The pilgrimage of the Sisters of Ascoli Piceno; The groups of Naples, Scandicci, Thiesi, Nonantola, and the pupils of the school “Sacred Heart of the Incarnate Word” of Palermo. A special thought and encouragement goes to the representatives of voluntary associations that promote the donation of organs, “noble and meritorious act” (Catechism, No. 2296). I would also like to welcome the employees of Mediaset Roma, with the hope that their work situation may be resolved, with the aim of realizing the company’s goodwill, not only its profits, but respecting the rights of all people involved. I want to conclude with great greetings to all the people of Genoa and a great thank you for their warm welcome that I received yesterday. May the Lord bless them abundantly, and may Our Lady of the Guard keep them.